Love To Crop! : Link Up Love Party with K Andrew and Getting Cricky!! Link Up Love Party with K Andrew and Getting Cricky!! 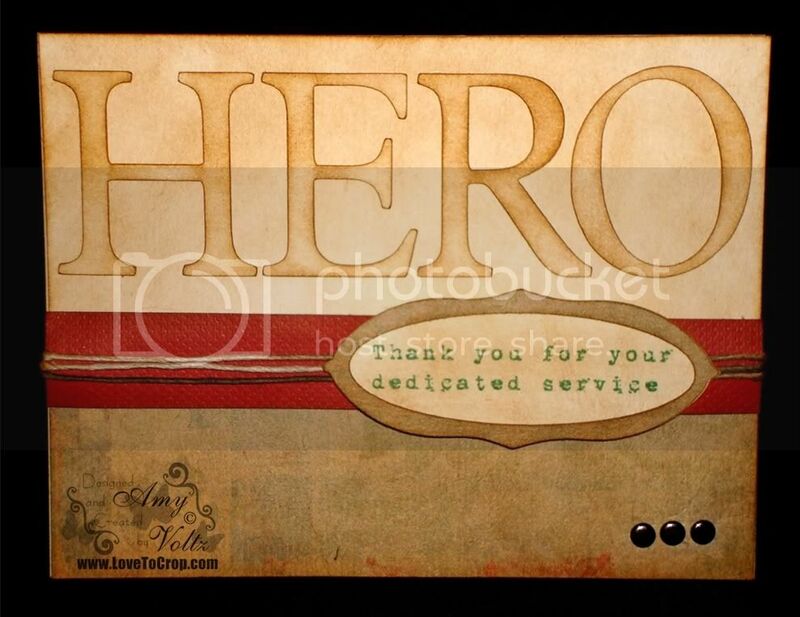 This is my "Thank You, Hero" card that I posted in the "Getting Cricky with it" Blog Hop (ya know, the one where we all said, "HOORAY! Kristal's stamps are now available!!")... Since I promised to post the details of each of those cards, I'm starting with this one. This is a standard A2 card (4.25"x5.5"). I started with a plain WHITE piece of cardstock measuring 4.25"x5.5"... I then cut the letters "H-E-R-O" at 2" using the font on the Plantin SchoolBook Cricut Cartridge from plain WHITE cardstock. I used caramel ink on a sponge to distress and 'color' each of the letters. I also used the ink/sponge to discolor the base paper -- giving it all an 'antique' look. After adhering the letters to the top half of the card, I added a 2" strip of 'designer' kraft cardstock from my stash of scraps... This kraft cardstock has a watermark-like image all over it and already had the red distressing at the edge (gotta love finding those perfect pieces for cards in your scraps! ); however, you could easily use regular kraft paper and sponge distress it for a similar look. Three bronze snaps were added to the paper before adhering it to the base. I added some variegated hemp cord to a 3/4" strip of textured brick cardstock, popped a strip of foam dimension to the back of the strip, and adhered that at the top edge of the kraft strip. My sentiment is one of the wonderful stamps found on K Andrew's "Freedom Isn't Free" Stamp Art Set... If you'd like to see all of her stamp sets (or get in on the final pre-orders), please CLICK HERE... 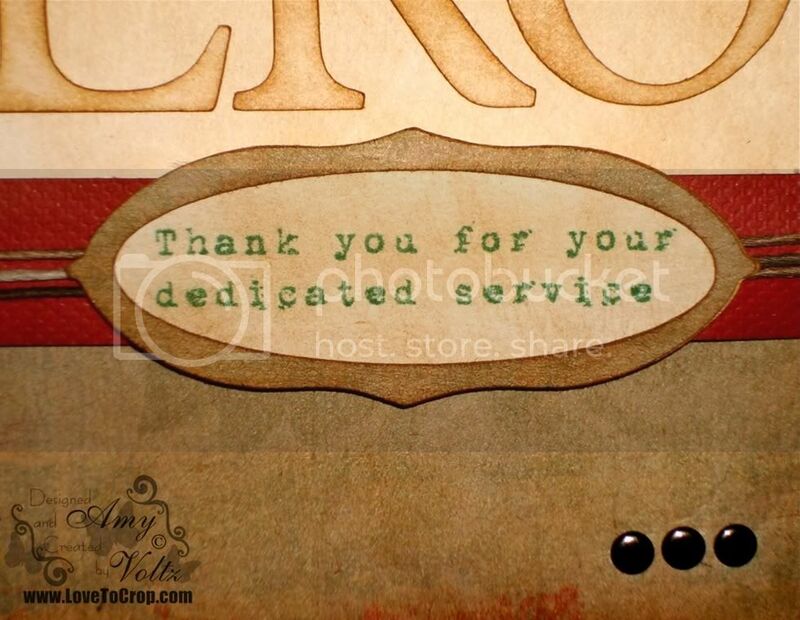 I stamped the sentiment with dark green ink onto smooth white cardstock and then inked it to match the card base. The frame was adjusted with my Gypsy, but can be found on the Reminisce Accents Cricut Cartridge. Truer words were never spoken... Sandy expressed that she misses her daughter (and both of her sons) every day. Even though she talks to them often, it would probably be easy for her to get down in the dumps missing them... It would be easy for her to be frustrated with the customer who hands her a stack of coupons... It would be easy for her to scan a cart full of groceries without mumbling more than the total to the customer on the other side of the conveyor belt... But Sandy chose to be that light today -- and she couldn't just be that light without having it reflect back on her!! Hi Amy! I am the blog behind you in the link up love party! What a wonderful card and thanks for sharing the wonderful experience you had with the grocery store cashier. I find that if I start a conversation with most people, they light up because they are acknowledged! Feels good every time! I love your card. Thank you for coming by my post. Super job. Ps. Thanks for your wonderful comments over at my blog I think Sandy's light has rubbed off on you. You shined some light on my Blog. Can never have too much light. I do so love this card. You did a great job like usual. I cam eover from the LULP. Amy, your card came out great! I love your card but even more I love your post. It was uplifting and wonderful to read. I too appreciate people who do their jobs with a positive attitude. Just think what a different world we would live in if more people chose to be that way too! Came to visit from LULP!! Wow Amy, you and Kristal have 2 things in common, you really know how to share an experience and you both are beautifully talented. You are now being the light ! I am uplifted! I could have sworn I already left a comment.. maybe it was on FB... t-hehehe, I'm already a huge fan of yours been following you here and on FB! I just love this card, I showed my Husband and he really like it too! Great card, and what a great story! Terrific card to dedicate to those Sandy's who choose happiness and to brighten other's days and are dedicated to whatever they do. New follower from K.Andrew's LLUP, I hope you come over & follow me too. Neat project. Hi Amy, I'm here for the LULP! Your blog is so cute! I also really love your card, it's so simple and beautiful... I am now a new follower! Love your card and the story just warmed my heart. I love it when people in the customer service field actually give good and friendly service. It is, unfortunately, a rare occurrence these days. Thanks for sharing your experience. I am already a follower but I am also stopping by from the Link Up Love Party. I would love it if you stop by my blog as well. Great projects!! Amy please stop by my blog and pick up an award! Your card is beautiful as is this post. Stopping by from the LULP. I am popping over from Ms. K's LULP. Your post brought such a smile to my face, thank you for sharing along with your BEAUTIFUL card. Love the vintage look of this!